Home / Pueblo Pottery For Sale / Laguna Pottery by Robert Kasero, Sr. 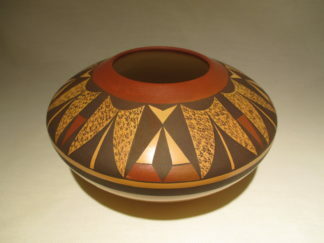 Stunning Laguna Pueblo Pottery by Robert Kasero, Sr. BEAUTIFUL design! Very thin walled pottery with precise geometric painted designs. Coil-built, and hand-painted with yucca leaf brushes. This gorgeous piece of pottery measures approximately 4″ tall and 7 3/4″ in diameter. Please watch the video!